Noam Chomsky in Conversation with Amy Goodman on Climate Change, Nukes, Syria, WikiLeaks & More | Democracy Now! world-renowned political dissident, linguist and author. He is institute professor emeritus at Massachusetts Institute of Technology, where he has taught for more than 50 years. His new book is Requiem for the American Dream: The 10 Principles of Concentration of Wealth & Power. AMY GOODMAN: In this Democracy Now! special, we spend the hour with the world-renowned linguist and political dissident Noam Chomsky. In a public conversation we had in April, we talked about climate change, nuclear weapons, North Korea, Iran, the war in Syria and the Trump administration’s threat to prosecute WikiLeaks founder Julian Assange. We also talked about Noam Chomsky’s new book, Requiem for the American Dream: The 10 Principles of Concentration of Wealth & Power. Hundreds of people packed into the First Parish Church in Cambridge, Massachusetts, for our public conversation. Take a look at the last primary campaign—plenty of publicity, very little comment on the most significant fact. Every single candidate either denied that what is happening is happening—namely, serious move towards environmental catastrophe—or there were a couple of moderates, so-called—Jeb Bush, who said, “Maybe it’s happening. We really don’t know. But it doesn’t matter, because fracking is working fine, so we can get more fossil fuels.” Then there was the guy who was called the adult in the room, John Kasich, the one person who said, “Yes, it’s true. Global warming’s going on. But it doesn’t matter.” He’s the governor of Ohio. “In Ohio, we’re going to go on using coal for energy, and we’re not going to apologize for it.” So that’s 100 percent commitment to racing towards disaster. Then take a look at what’s happened since. The—November 8th was the election. There was, as most of you know, I’m sure, a very important conference underway in Morocco, Marrakech, Morocco. Almost roughly 200 countries at the United Nations-sponsored conference, which was—the goal of which was to put some specific commitments into the verbal agreements that were reached at Paris in December 2015, the preceding international conference on global warming. The Paris conference did intend to reach a verifiable treaty, but they couldn’t, because of the most dangerous organization in human history. The Republican Congress would not accept any commitments, so therefore the world was left with verbal promises, but no commitments. Well, last November 8th, they were going to try to carry that forward. On November 8th, in fact, there was a report by the World Meteorological Organization, a very dire analysis of the state of the environment and the likely prospects, also pointed out that we’re coming perilously close to the tipping point, where—which was the goal of the—the goal of the Paris negotiations was to keep things below that—coming very close to it, and other ominous predictions. At that point, the conference pretty much stopped, because the news came in about the election. And it turns out that the most powerful country in human history, the richest, most powerful, most influential, the leader of the free world, has just decided not only not to support the efforts, but actively to undermine them. So there’s the whole world on one side, literally, at least trying to do something or other, not enough maybe, although some places are going pretty far, like Denmark, couple of others; and on the other side, in splendid isolation, is the country led by the most dangerous organization in human history, which is saying, “We’re not part of this. In fact, we’re going to try to undermine it.” We’re going to maximize the use of fossil fuels—could carry us past the tipping point. We’re not going to provide funding for—as committed in Paris, to developing countries that are trying to do something about the climate problems. We’re going to dismantle regulations that retard the impact, the devastating impact, of production of carbon dioxide and, in fact, other dangerous gases—methane, others. OK. So the conference kind of pretty much came to a halt. The question—it continued, but the question was: Can we salvage something from this wreckage? And pretty amazingly, the countries of the world were looking for salvation to a different country: China. Here we have a world looking for salvation to China, of all places, when the United States is the wrecking machine that’s threatening destruction, in—with all three branches of government in the hands of the most dangerous organization in human history. And I don’t have to go through what’s happened since, but the—in general, the Cabinet appointments are designed to—assigned to people whose commitment and beliefs are that it’s necessary to destroy everything in their department that could be of any use to human beings and wouldn’t just increase profits and power. And they’re doing it very systematically, one after another. EPA, Environmental Protection Agency, has been very sharply cut. Actually, the main department that’s concerned with environmental issues is the Department of Energy, which also had very sharp cuts, particularly in the environment-related programs. In fact, there’s even a ban on posting and publishing information and material about this. And this is not just at the national level. The Republican Party, whatever you want to call it, has been doing this at every level. So, in North Carolina, a couple of years ago, where the Legislature, mostly thanks to gerrymandering, is in the hands of the Republicans, there was a study. They called for a study on the effect of sea level rise—on what sea level rise might be on the North Carolina coast. And there was a serious scientific study, which predicted, in not—I forget how many years—not a long time, about roughly a meter rise in sea level, which could be devastating to eastern North Carolina. And the Legislature did react, namely, by passing legislation to ban any actions or even discussion that might have to do with climate change. Actually, the best comment of this—I wish I could quote it verbatim—was by Stephen Colbert, who said, “If you have a serious problem, the way to deal with it is to legislate that it doesn’t exist. Problem solved.” You know, this is going on all over the country. And it’s not just—it’s not simply climate change. That’s bad enough. But there’s another huge specter that we’re kind of trying to survive under, and that’s nuclear war. That’s a whole other story. Here, both the Obama administration and, increasingly, Trump are radically increasing that danger. This—the threat of the new developments is captured very effectively in the best, simple monitor of the state of the world, established at the beginning of the nuclear age by the Bulletin of Atomic Scientists. I’m sure you all know about this, but the Bulletin of Atomic Scientists regularly brings together a group of scientists, political analysts, other very serious people, to try to give some kind of estimate of what the situation of the world is. The question is: How close are we to termination of the species? And they have a clock, the Doomsday Clock. When it hits midnight, we’re finished. End of the human species and much else. And the question every year is: How far is the minute hand from midnight? Well, at the beginning, in 1947, beginning of the nuclear age, it was placed at seven minutes to midnight. It’s been moving up and back ever since. The closest it’s come to midnight was 1953. 1953, the United States and Russia both exploded hydrogen bombs, which are extremely serious threat to survival. Intercontinental ballistic missiles were all being developed. This, in fact, was the first serious threat to the security of the United States. There’s an interesting story behind that, but I’ll put it aside, unless there’s time to talk about it. But then, it came to two minutes to midnight. And it’s been moving up and back since. Two years ago—2014, I think it was—the analysts took into account for the first time something that had been ignored: the fact that the nuclear age—the beginning of the nuclear age coincided with the beginning of a new geological epoch, the so-called Anthropocene. There’s been some debate about the epoch in which human activity is drastically affecting the general environment. There’s been debate about its inception. But the World Geological Organization has recently determined that it’s about the same time as the beginning of the nuclear age. So we’re in these two eras in which the possibility of human survival is very much at stake, and, with us, everything else, too, of course, all living—most living things, which are already under very severe threat. Well, a couple of years ago—I think it was 2014—the Bulletin began to take that into account and moved the minute hand up to three minutes to midnight, where it remained last year. A couple of—about a week into Trump’s term, the clock was moved again, to two-and-a-half minutes to midnight. That’s the closest it’s been since 1953. And that means extermination of the species is very much an—very much an open question. I don’t want to say it’s solely the impact of the Republican Party—obviously, that’s false—but they certainly are in the lead in openly advocating and working for destruction of the human species. I agree that’s a very outrageous statement. So I therefore simply suggest that you take a look at the facts and see if it has any merit or if it just should be bitterly condemned. That’s up to you. My view, the facts are pretty clear. AMY GOODMAN: At this point, as President Trump nears his 100th day, North Korea and Iran have been a major focus. Are you concerned that with the president at the lowest popularity rating, I think, in any president’s history at this point, that he will focus abroad, as he has in the last few weeks, dropping the MOAB, the “Mother of All Bombs,” in Afghanistan, bombing the Syrian government, and yet focusing specifically on North Korea and Iran—in North Korea, McMaster, General McMaster, the national security adviser, saying tensions with North Korea are coming to a head. Do you think there is a possibility that the U.S. would attack North Korea? NOAM CHOMSKY: I mean, this administration is extremely unpredictable. Trump probably has no idea what he’s going to do five minutes from now, so you can’t—literally—so you can’t really make predictions with much confidence. But I doubt it very much. The reason is very simple: An attack on North Korea would unleash—no matter what attack it is, even a nuclear attack, would unleash massive artillery bombardment of Seoul, which is the biggest city in South Korea, right near the border, which would wipe it out, including plenty of American troops. That doesn’t—I mean, I’m no technical expert, but as far as I can—as I read and can see, there’s no defense against that. Furthermore, North Korea could retaliate against American bases in the region, where there’s plenty of American soldiers and so on, also in Japan. They’d be devastated. North Korea would be finished. You know, so would much of the region. But if attacked, presumably, they would respond, very likely. In fact, the responses might be automatic. McMaster, at least, and Mattis understand this. How much influence they have, we don’t know. So I think an attack is unlikely. But the real question is: Is there a way of dealing with the problem? There are a lot of proposals: sanctions; a big new missile defense system, which is a major threat to China, it’ll increase tensions there; military threats of various kinds; sending an aircraft carrier, the Vinson, to North Korea, except by accident—it happened to be going in the opposite direction, but we’ll forget that. But these are—those are the proposals, that kind of proposals, as to how to solve. Actually, there’s one proposal that’s ignored. I mean, you see a mention of it now and then. It’s a pretty simple proposal. Remember, the goal is to get North Korea to freeze its weapons systems, weapons and missile systems. So one proposal is to accept their offer to do that. Sounds simple. They’ve made a proposal. China and North Korea proposed to freeze the North Korean missile and nuclear weapons systems. And the U.S. instantly rejected it. And you can’t blame that on Trump. Obama did the same thing a couple of years ago. Same offer was presented. I think it was 2015. The Obama administration instantly rejected it. And the reason is that it calls for a quid pro quo. It says, in return, the United States should put an end to threatening military maneuvers on North Korea’s borders, which happen to include, under Trump, sending of nuclear-capable B-52s flying right near the border. Now, maybe Americans don’t remember very well, but North Koreans have a memory of not too long ago, when North Korea was absolutely flattened, literally, by American bombing. There was—there was literally no targets left. And I really urge people who haven’t done it to read the official American military histories, the Air Quarterly Review, the military histories describing this. They describe it very vividly and accurately. They say, “There just weren’t any targets left. So what could we do?” Well, we decided to attack the dams, the huge dams. That’s a major war crime. People were hanged for it at Nuremberg. But put that aside. And then comes an ecstatic, gleeful description of the bombing of the dams and the huge flow of water, which was wiping out valleys and destroying the rice crop, on which Asians depend for survival—lots of racist comment, but all with exaltation and glee. You really have to read it to appreciate it. The North Koreans don’t have to bother reading it. They lived it. So when nuclear-capable B-52s are flying on their border, along with other threatening military maneuvers, they’re kind of upset about it. Strange people. And they continue to develop what they see as a potential deterrent that might protect the regime from—and the country, in fact—from destruction. This has nothing at all to do with what you think about the government. So maybe it’s the worst government in human history. OK. But these are still the facts that exist. There are similar questions to raise about Iran. So, Iran is, you know, the—again, the adults in the room, like Mattis and so on, say it’s the greatest threat to peace, you know, the greatest sponsor of terrorism, on and on. How is it a sponsor of terrorism? Well, could go through that. So, for example, in Yemen, it’s claimed that they are providing some aid to rebel tribesmen, Houthi tribesmen, in Yemen. OK, maybe they are. What is the United States doing in Yemen? It’s providing a huge flood of arms to its Saudi Arabian ally, who are destroying the country, who have created a huge humanitarian crisis, huge numbers of people killed, massive starvation. They’re threatening now to bomb a port, which is the only source of aid for surviving people. But Iran is the major source of terrorism. 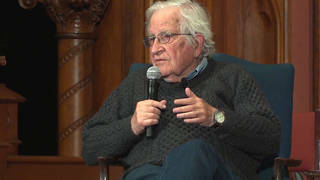 AMY GOODMAN: MIT professor emeritus Noam Chomsky in a public conversation we recorded in April at the First Parish Church in Cambridge, Massachusetts. When we come back, we’ll talk about Syria, WikiLeaks and more. AMY GOODMAN: Patti Smith, singing at Democracy Now! 's 20th anniversary at the Riverside Church in New York. This is Democracy Now!, democracynow.org, The War and Peace Report. I'm Amy Goodman, as we return to my public conversation with Noam Chomsky, the acclaimed linguist and dissident, professor emeritus at the Massachusetts Institute of Technology. We recorded this in April at the First Parish Church in Cambridge, Massachusetts. Hundreds of people packed into the church. AMY GOODMAN: I last interviewed you on April 4th, just a few weeks ago, on Democracy Now!. It was the 50th anniversary of Dr. King giving his “Beyond Vietnam” speech, why he opposed the war in Vietnam, where he called the U.S. “the greatest purveyor of violence in the world.” And I wanted to turn from North Korea and Iran to Syria. It was the day of the gas attack in Syria, so we didn’t get to talk about it very much. And I’m wondering your thoughts on what you think happened, and then the ensuing U.S. bombing that President Trump would later talk about, saying he was having chocolate cake with the Chinese president—very, very good chocolate cake—when they launched the Tomahawk missiles into Iraq, he said. And he was corrected by the interviewer—right?—who said it was actually Syria. NOAM CHOMSKY: Bunch of “ragheads”; it’s all about the same. But, well, there are some things we know for sure. There was a serious chemical weapons attack. Nobody doubts that. It’s plausible that it was the Syrian government, which does raise some questions. It’s not so obvious why the Assad regime would have carried out a chemical warfare attack at a moment when it’s pretty much winning the war, and the worst danger it faces is that a counterforce will enter to undermine its progress. So it does raise some questions. It also—even though maybe you can think up some reason why the Assad regime, which is a murderous, brutal regime, might have done it, there’s even another question as to why the Russians would have allowed it. Now, remember, this is a—the air base is a joint Russian-Syrian base. Russia has plenty of clout in Syria. And for them, it’s a total disaster. They have global concerns, not just local concerns in Syria. So there are some concerns. And there are further concerns. There has been—the White House did put out a careful—you know, a justification, an intelligence report, to explain and account for, showing why they had absolute confidence that it was a Syrian government attack. This was analyzed closely by a very serious and credible analyst, Theodore Postol, professor at MIT, who has a long record of highly successful, credible analysis. He’s a highly regarded strategic analyst and intelligence analyst. And he gave a pretty devastating critique of the White House report. You might—you can pick it up online and take a look at it. So there certainly are some questions. That there’s—that Syria is capable of a monstrous act like that, the Syrian government, that much is not in doubt. But one question that arises is: Before doing something, could you find out what happened? OK? I mean, let’s have an inquiry, take a look and see what in fact actually happened. There are plenty of cases where things—where it looked as though things happened, but they didn’t. And remember that reporting from Syria is extremely difficult. If reporters go into the rebel-held areas and don’t do what they’re told, you know, get your head cut off. Patrick Cockburn and others have written about this. You just can’t seriously report from those areas. There are obvious questions when you’re reporting from the government side. So the reporters are—there are very good reporters doing a serious, courageous job, but there’s not much you can do. So we just don’t know a lot. Well, those are the circumstances in which the 59 Tomahawk missiles were launched. That’s pretty easy. It’s easy to sit in Washington and push a button and say, “Go kill somebody.” That’s considered courage, you know, macho, showing how strong we are. What did they actually do? Well, apparently, the Tomahawk missiles were targeting a part of the airfield that doesn’t seem to be used. And, in fact, the next day, planes were taking off. And, in fact, the village that was attacked by the chemical weapons has been even more heavily attacked by straight bombing from the Assad government after the 59 Tomahawk missiles. So whatever they were intended to do doesn’t seem to have anything to do with Syria. I suspect that what they were intended to do was pretty much what you described, to shore up Trump’s image as—I think it was Nikki Haley at the U.N., said, “There’s a new sheriff in town.” So now we’ve got Wyatt Earp, you know, pulling out his gun and getting rid of the bad guys. No more of this soft stuff. So, it was probably an attempt to shore up that image. Pretty much like the bomb in Afghanistan. Nobody knows what it was for, what it had to do with. Probably destroyed a large part of Afghanistan. Shortly after that, there was a mass—an incredibly brutal and successful Taliban attack, which killed a couple hundred recruits, most of them unarmed. The young draftees didn’t know what they were doing. It was so bad, the defense minister resigned. Doesn’t seem to have any effect on—it was supposedly aimed at ISIS. Maybe it was. Maybe it wasn’t. They don’t seem to be affected by it. So these look like—there doesn’t seem to be any strategic analysis behind any of these actions, as far as anyone can tell. They seem like kind of about at the level of the twitters that keep coming out: something that kind of occurs to me, so why not do it? It’s cheap. It may kill a lot of people, makes me look good and, you know, makes it seem as if I’m defending the country, and so on. It’s hard to see it as anything but that. That these things help the people of Syria and Iraq is very hard to imagine. AMY GOODMAN: What do you think has to be done to solve the crisis, the humanitarian catastrophe, in Syria? NOAM CHOMSKY: In Syria, it’s a terrible catastrophe. And, you know, unfortunately, there isn’t a lot that can be done about it. There are some things that can be done. I mean, the idea that you can send in the Marines and bomb and so on, that has a small problem. If you do, you probably set off a nuclear war, and not only is Syria destroyed, the rest of Syria, but the rest of the world, too. So there’s a little difficulty in that scenario, whatever one thinks about the justification for it. So what can be done? Well, one thing that can be done, which is really easy, very easy, is to take care of the people fleeing from this disaster. I mean, there are huge numbers of people fleeing from the disaster. What do we do about them? Make sure they don’t come here, you know, kind of like people fleeing from—you know, my relatives, in fact, fleeing, trying to flee from Eastern Europe under the—before when the Nazis were coming along. “We don’t want ’em. Not here.” You know. So the Syrians don’t come—maybe a tiny trickle, but very few come here. Europe’s not that much better—in fact, pretty horrible, too. So one thing you could do is just take care of the people who are fleeing the disaster. Another thing you can do is provide humanitarian aid for those in the region. Now, there are countries who are absorbing refugees, remember, like take Lebanon. It’s not a rich country like us. Poor country. About 40 percent of the population are refugees, many of them fleeing from the Israeli wars as far back as '48, many—huge number of Syrians. Jordan, another poor country, has absorbed a huge number of refugees. Turkey has a couple of million. Iran has accepted refugees. So there are very—there are poor countries that are accommodating refugees, but not the rich countries. The rich countries, it's not our business, certainly not us. It’s even a more serious problem with regard—for us, moral problem, with regard to Central America, but let’s keep to Syria. So another thing you could do is provide badly needed aid and assistance for those who have succeeded in fleeing the disaster, or who remain in parts of Syria where survival is possible, but are living under horrible conditions. Now, that’s all cheap and easy, a tiny fraction of increasing the military budget to cause more destruction. AMY GOODMAN: Noam, I wanted to, before we get to your book, your latest book, ask you about this latest development in the United States. The director of the Central Intelligence Agency gave his first major address, and he focused on WikiLeaks. And it looks like now the U.S. is preparing an arrest warrant for Julian Assange, who’s been holed up in the Ecuadorean Embassy in London for almost five years now. Pompeo calling WikiLeaks a “hostile non-state intelligence service,” calling Julian Assange himself a “demon,” and said he’s not protected by the First Amendment. Your thoughts? NOAM CHOMSKY: Well, I think it speaks for itself. WikiLeaks has released lots of information that governments don’t like. It’s overwhelmingly information that citizens should have. It’s information about what their governments are doing. And perfectly natural that systems of power don’t want to be exposed, so they’ll do what they can to prevent exposure. I think it’s a disgraceful act. In fact, I think it’s disgraceful even to keep Julian Assange holed up in the Ecuadorean Embassy. I did visit him there once, but you can guess yourself. It’s, in many ways, worse than imprisonment. At least if you’re in prison, you can see other prisoners, and you can get out and look at the sunshine now and then. He’s in a small apartment, where he can’t go out. You know, he can go to the balcony, but that’s about it, a small—basically, a couple of rooms inside a small apartment. It’s not a big embassy. The embassy is like a kind of an apartment in London, surrounded by police and so on. There’s been no credible basis for any of this. And to go on to try to raise it to the level of criminal prosecutions, I think, is, again, one of these efforts to look tough at home, and the kind of effort that a government would carry out that is dedicated to trying to protect itself from exposure of facts that citizens should have, but systems of power don’t want them to have. I think that’s the crucial issue. AMY GOODMAN: The suggestions are it has to do with his aiding and abetting perhaps Chelsea Manning and also Edward Snowden, doing that with Edward Snowden, which he openly admits, while he’s trapped in the Ecuadorean Embassy. NOAM CHOMSKY: If the charge is true, he should be honored for it. Chelsea Manning and Edward Snowden carried out heroic, courageous acts. They fulfilled the responsibility of somebody who takes citizenship seriously—that is, who believes that the people of a country ought to know something about what their government is up to. OK? Like if their government is carrying out murderous, brutal attacks in Iraq, people should know about it. Takes us back to Martin Luther King’s talk in 1967. If the government is, and corporations, too, incidentally, are listening in to your telephone conversations and what you’re doing, you know, tapping this discussion and so on, we should know about it. Governments have no right to do things like that. And people should know about it. And if they think it’s OK, fine, let them decide, not do it in secret. And I think people wouldn’t agree to it. That’s why it’s kept secret. Why else keep it secret? You know? And these are people who exposed it at great risk to themselves. So those are heroic, courageous acts. If WikiLeaks was abetting them, more power to them. That’s what they should be doing. AMY GOODMAN: I mean, President Trump endorsed WikiLeaks, right? He said, “I love WikiLeaks,” during the campaign. AMY GOODMAN: Professor Noam Chomsky in conversation in April at the First Parish Church in Cambridge, Massachusetts. When we come back, he’ll talk about the media’s coverage of the Trump administration, and his new book, Requiem for the American Dream: The 10 Principles of Concentration of Wealth & Power. We’ll be back in a minute. AMY GOODMAN: Alynda Segarra of Hurray for the Riff Raff singing “Rican Beach,” here in our studios at Democracy Now! This is Democracy Now!, democracynow.org, The War and Peace Report. I’m Amy Goodman, as we return to our public conversation with the acclaimed linguist and dissident Noam Chomsky. It was recorded in April at the First Parish Church in Cambridge, Massachusetts. AMY GOODMAN: Speaking of entities that President Trump doesn’t like, he calls the press the enemy of the American people, the enemy of the people. Can you assess, as the media assesses President Trump in his first a hundred days, the media’s behavior? NOAM CHOMSKY: Well, I think the media has fallen over backwards to try to give him some protection and leeway. I mean, you know, there are things that are so ludicrous and outrageous that a reporter simply can’t keep from saying something about them, like there’s one ridiculous claim after another that comes out of the tweets—you know, 3 million illegal undocumented refugees voted for Clinton, Obama wiretapped the Trump Tower, you know, one after another. My sense is—this is just a guess—that this is a media strategy, that it’s the Bannon-Trump-Spicer strategy to try to keep attention focused on one or another form of lunacy, but not look at what’s actually happening. And what’s actually happening is that Paul Ryan and his associates behind the scenes are systematically and carefully dismantling every element of government that is of any benefit to people and that doesn’t maximize corporate power and profit. I mean, the dedication of the Republican leadership, especially the Ryan-type leadership, their dedication to slavish servility to corporate power and wealth is just phenomenal. I mean, read this morning’s business pages. Their latest step is to try to prevent exposure of complaints against banks that carry out improper activities. It is possible now, thanks to the Consumer Protection Act, for people to criticize when they think a bank has carried out some improper activity. But we’ve got to keep that silent, you know, because we have to protect corporations from any exposure of criminal activities they might carry out. I mean down to that level, in fact, everywhere you look. I mean, the healthcare proposal was so shocking that, I mean, it was a proposal basically to cut taxes for the rich and to ensure that poor and middle-class people—the people who voted for Trump, in fact—don’t get medical aid. As you saw, of course, the Congressional Budget Office estimated 24 million additional people uninsured. There was an analysis of that by Steffie Woolhandler and David Himmelstein, two health specialists, just studying the relationship between lack of insurance and deaths. There’s plenty of evidence about that. And it turns out that would have meant about 45,000 additional deaths a year. Well, that’s OK, as long as you cut taxes for the rich. And step by step, that’s what’s happening behind the façade of Trumpisms and, you know, Spicer antics before the press. And the press is pretty much falling for it. That’s what they focus on, not what’s being carried out. There is, of course, criticism—mild criticism—of outrageous lies, but I think that just plays the game. That’s what the lies are for. Then you can yell about the liberal press that is trying to undermine us. It’s all a kind of a desperate effort to keep a con game going. Trump does have a base, a voter base. He’s kicking them in the face with abandon. And the idea is: How do you hold onto them while you’re doing this? Not an easy trick. And this, I think, is part of the con. And there are people in the press who are pointing it out—Paul Krugman, for one—but nothing like it should be. AMY GOODMAN: Which takes us to your latest book, Requiem for the American Dream, where you talk about the 10 principles of the concentration of power and wealth, how it’s happening, what to watch out for. NOAM CHOMSKY: Well, credit for the 10 principles should go to the producers of the film. What they did was take a lot of interviews and discussions about all sorts of things and put them in a coherent and, I think, pretty effective form, including formulating 10 principles—that’s their contribution—and including material that discusses them. And you can look at the film and see, or the book, but my feeling is they did a really good job. I’m impressed by it. AMY GOODMAN: So the book is accompanying this film that is now out on Netflix. But you talk about, for example, principle one, reducing democracy; principle two, shaping ideology; and principle three, redesigning the economy. NOAM CHOMSKY: Well, all of those fall together, and they’re part of a pretty remarkable development that’s taking place in—actually, in human history. Humans, in the last 60 or 70 years, have succeeded in creating a kind of a perfect storm, literally. Two—there’s a kind of a pincers movement that we’ve created, two major attacks on the prospects for survival: global—global warming, nuclear weapons, the Anthropocene, the nuclear age. And the third is a set of socioeconomic policies designed to undermine the possibility of dealing with the problems. The problems could be dealt with only in a functioning democracy of engaged, informed people, who could make decisions, who would be informed and could make decisions to deal with the crises. But the so-called neoliberal programs of the past generation, the sort of somewhat market-oriented programs, designed to undermine the institutions, the governmental and popular institutions, that might deal with these issues, it’s all a unit. One result is a very significant decline in democracy. You can see it in the—which is almost built into the policies. It’s perfectly built—you can’t carry out economic policies of the type that have been—that have been implemented in the past generation in a functioning democracy. That’s impossible. I mean, just take a look at the numbers. So, the neoliberal programs were basically taking off right around 1980. It escalated—started a little with the late Carter, escalated under Reagan, went on more under Clinton and so on. 2007 was the peak of supposed success. This is right before the crash. A lot of euphoria among economists, political analysts about the great achievements of neoclassical economics, of the great moderation, you know, the neoliberal programs, a dismantling of regulations—all these great successes, 2007. What was happening to American working people at that time? In 2007, wages, real wages, were lower than they had been in 1979 when the experiment took off. In fact, for the majority of the population, it’s a period of stagnation or decline. Benefits have declined. People had been—some of the reasons were explained by Alan Greenspan, head of the Federal Reserve, who was in charge pretty much of managing the economy. He testified to Congress that part of the success of the economy, the low inflation and so on, was due to what he called growing worker insecurity. Working people were insecure. They were intimidated. They knew that they were in a dangerous situation, precarious situation. As a result, they didn’t press for increase in wages and—for decent wages and benefits. They were willing to accept, in fact, an effective decline in their living standards. And Greenspan, who was a close observer of the economy, pointed out that this continued, even when jobs were increasing in the late Clinton period. It was deeply embedded in the nature of the policies being carried out, that working people are intimidated, they’re living precarious lives, many of them are part-time, they’re losing security, their unions are being destroyed, and their wages are declining. So it’s all great. The economy is wonderfully healthy. Can you carry out policies like that in a democracy? I mean, are people going to vote for it? Same in Europe, even worse in many ways. The so-called austerity programs, even the economists of the International—the IMF, International Monetary Fund, their own economists say—report that these policies make no economic sense. But the IMF bureaucrats, the ones who are part of the decision-making apparatus, they vote for them. How do you—and the effect on Europe is the same thing, as far as democracy is concerned. Just like in the United States, there’s anger, contempt for major—for centrist—you know, for the major governing institutions. Here, it’s Congress; there, it’s the political parties. You just saw it in France yesterday: The two major parties were barely visible in the election. And it’s happening all over Europe, same kind of thing that’s happening here. I mean, here, it’s happening in a way which is almost farcical because of the—you know, the kind of actions carried out by the leadership. In Europe, it’s being—it’s being pursued in a way which is really ominous. I mean, you don’t have to look far back to find a time when fascist parties actually had power in Europe. And we know what happened. And now there are neofascist parties, with fascist roots often, which are pretty close to power, even in places like Austria and Germany, which have some memories about. France, as well, was—under the Nazis, was a very pro-Nazi country, the Vichy government. It was rounding up Jews faster than the Germans wanted them. A really ugly record. And seeing these things come back, or just seeing a situation in which, according to recent polls, a majority of Europeans think there should be no more Muslims in Europe, I mean, that evokes some memories, not nice ones. And a lot of—you can’t attribute it all to the neoliberal economic policies, but a lot of it does follow from that. When you impose on people circumstances of this kind, you have to make sure that they have no way of responding politically. In Europe, it’s done pretty straightforwardly. The main decisions about socioeconomic policies are made by the so-called troika—IMF, European Central Bank and the European Commission, which is unelected. So three unelected bodies, they make the decisions. They do listen to voices, the voices of the northern banks, mostly German banks. And the people suffer. And they get—they are angry, frightened, often reacting in dangerous ways. We see similar phenomena here. So, to go back to the pincers movement, what’s happened is we’ve created two huge threats to survival. We have systematically—not you and me, but the leadership has systematically created socioeconomic policies, which have as a consequence, almost immediate consequence, the undermining of functioning democracy—the one thing that might deal with the disasters. Like I said, it’s a kind of perfect storm. Real credit to the human species to have contrived something like this. AMY GOODMAN: Principle four is shift the burden onto the poor and the middle classes. Principle five, attack the solidarity of the people. Six, let special interests run the regulators. Seven, engineer election results. Eight, use fear and power of the state to keep the rabble in line. 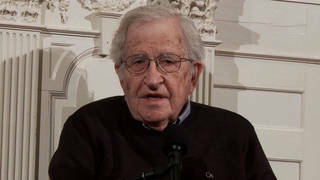 NOAM CHOMSKY: Is it necessary to comment? I think you’re all familiar with it. AMY GOODMAN: Nine is manufacture consent, and principle 10 is marginalize the population. NOAM CHOMSKY: Well, in fact, that’s exactly what’s happening. And it’s the—and there’s a reason for it. You cannot carry out the kinds of policies that have been developed in the last generation, and have the population function democratically. In Europe, you can’t get people to vote for policies which are undermining their lives; which are leaving especially younger people without any hopes of decent employment; which are driving people to precarious existences; which are undermining wages, reducing benefits; in England right now, undermining, threatening what had been the world’s most—by far, the world’s most effective and efficient national health system. You can’t get people to vote for things like this. So what you have to do is marginalize them in one way or another, turn them against each other, aim—turn their anger against vulnerable people—that’s standard technique—get people to—don’t look at the people who are really doing this to you. Look at the ones who are more vulnerable: immigrants, the poor, you know, Muslims, blacks—anybody. We’re familiar with that, too. There’s not a slight history about it. Actually, there were people who warned against it. There were people who knew, a lot of left independent economists, but even people right out of the mainstream, like Joseph Stiglitz, Nobel laureate. Back around 1995 or so, he wrote an article, actually in a World Bank research journal, in which he warned against what he called the “religion that the market knows best.” He says that’s the religion, as he put it, that’s being followed by economists. And he says you’ve got to take a look at that religion. Like a lot of religions, it just doesn’t work. Economic history and even logic show us lots of things that are wrong about it. But that was pursued with abandon on the basis of theories of efficient markets, you know, rational behavior, rational expectations and so on—none of which had any empirical basis or founding. But they were the—the doctrines were accepted for the very simple reason that they were highly beneficial to wealth and power. That makes them acceptable. And you get the results that you have: the undermining of the only means possible to try to deal with the existential crises that we have created. So, again, it’s a kind of perfect storm, part—all sorts of sources, including just socioeconomic policies of a bipartisan nature. AMY GOODMAN: Noam Chomsky, speaking April 24th at the First Parish Church in Cambridge, Massachusetts, professor emeritus at the Massachusetts Institute of Technology. His latest book, Requiem for the American Dream.